A Hanaeleh Horse Needs YOU! We rescue all breeds and ages of horses, and after we rehabilitate them, we work to find them new loving homes. When horses are not adoptable due to severe neglect or abuse, we provide sanctuary for them to live out their days knowing they’ll always be loved and cared for. Set up your tax-deductible monthly sponsorship today! Hanaeleh is a 501(c)(3) (Tax ID 20-3255341) non-profit horse rescue operating in Southern California since 2004. 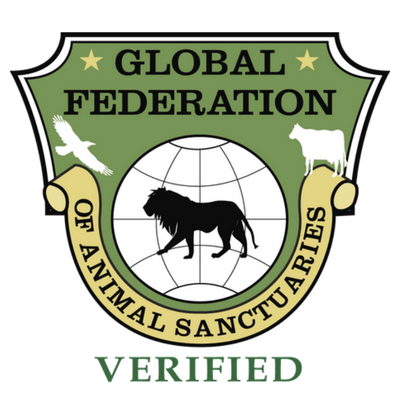 We’re a Verified Rescue with Global Federation of Animal Sanctuaries and Platinum-Star rated on Guidestar. We are not funded by anyone except YOU (our awesome supporters). Your support makes a huge impact – 100% of your donation goes to caring for our horses. Sponsor a Hanaeleh horse by clicking Sponsor a Horse below. Be sure to let us know which horse you are sponsoring or if it’s simply a general sponsorship. I was found in Watts, emaciated, running in the street. Cars were dodging me and people threw trash at me. I’m living at Hanaeleh now and things are looking up! I was found, emaciated, walking on a busy street in Los Angeles with my horsie friend. He didn’t make it but I survived and now my life is so much better! Hershey returned to Hanaeleh after 10 years with his adopter. We welcome all our horses back no matter the situation. Quixote – kept in a stall for 2 years with very little food or exercise. He was 350 lbs underweight at rescue. Sapphire – her former abusive owner wanted her to get out of his way. She didn’t understand what he wanted so he ran into her with his car. Onyx – rescued 6/20/18 from a neglect/abuse situation. She was 400 lbs underweight, her teeth and feet had been severely neglected. Ulysses – found in a dry riverbed starving by animal control. He was a victim of Charro riding and has permanent neurological issues. Stetson – he was a lesson horse who got older and became handicapped with neurological issues and cushings. We rescued him before he faced an uncertain future. Venus – rescued August 2018. She was severely neglected and is blind in one eye. Popcorn is a Palomino Paint. He wasn’t getting the care he needs so he came to live at Hanaeleh. Your sponsorship will make a difference in a rescued horse’s life! Along with a photo of your horse you’ll receive updates anytime you wish (just email us!) and our newsletter. Be sure to let us know which horse you’re sponsoring or if it’s simply a general sponsorship. Hanaeleh is a non-profit 501(c)(3) horse rescue (Tax ID 20-3255341). Your donation is tax deductible!